The Candy Store | I made that! Sometimes a project just smacks you on the head. It’s been a busy two weeks, first a trip to the Cascades (gorgeous!) and then a literal PILE of friends from San Francisco descended on Seattle for a weekend of total gluttony (and all I’m gonna say about that is “Don’t eat a Bacon Cheeseburger at Lunchbox Laboratory before noon. It hurts.”). And the sun. Did I mention the sun? It’s been shining over Seattle for two weeks. There was no way I was spending my days in the kitchen. I was planting a montmorency cherry tree in my front yard. And blueberry and raspberry bushes in the back. And if I can convince John to drive me back to the nursery I suspect we’ll be adding a comice pear tree to the family. BUT. Back to projects. For some reason caramels just keep popping up. Everywhere. I go out to eat and one gets handed to me with the bill. I go to candy stores and they are there, taunting me. Even Pantea bought me a box as a present before flying away. The weird thing is, for some strange reason, they all tasted like raisins. I can’t explain it, but it was making me think that I left my taste buds in San Francisco. So I decided to make my own. I poked around on the interweb and found a recipe that had the two magic words: salt and creme fraiche. The only changes I made were adding some vanilla and slightly lowering the salt, because I didn’t want that to be ALL one tasted. First I warmed up some creme fraiche over low heat. While that was warming I heated up butter, sugar, corn syrup, milk, vanilla bean seeds and salt. This started out easy enough, but it was a tad tricky getting it up to 300 degrees without it burning in spots. There was a lot of stirring involved. I would have taken pictures, but I unfortunately only have 2 hands. Once it was nice and dark (and 300 degrees) I poured the mixture into a foil lined baking pan. I let it sit overnight to cool. Then I began the arduous task of slicing it into individual pieces. Can we just take a moment to appreciate that Seattle sunlight? And candy was had by all! Well, by me and John anyways. I think I’ll be mailing some of this off to friends, because there is just no reason two people need this much deliciousness in their home. 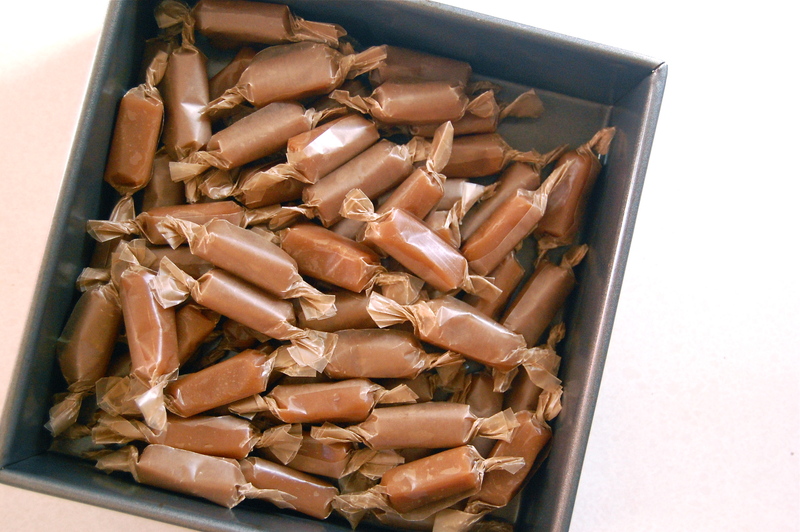 And btw, I am happy to report that these caramels did not even remotely taste like raisins. I dare say they were perfect. – Line an 8″ square cake pan with foil and brush with melted butter. 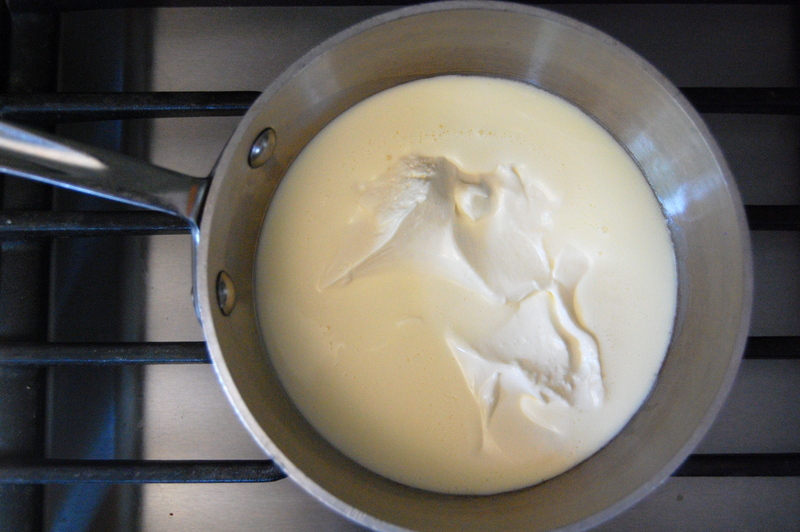 – Put creme fraiche in small saucepan over low heat. You want it all loose and melty, not boiling. – Rub vanilla bean seeds into sugar and place all the ingredients (minus creme fraiche) in a medium sauce pan. Heat over high with a thermometer in place, stirring occasionally. Once it starts to take on color, stir constantly, scraping around the sides to prevent scorching. – When it reaches 300 degrees, very very slowly pour in the creme fraiche. Since it will probably splatter and attack you, I recommend wearing an oven mitt for protection. Because caramel burns, they hurt. And they scar. Stir the crap out of the caramel, getting all the lumps out. – Once it is perfectly smooth, pour it into the lined cake pan. Let it cool completely, at least a few hours. – Turn the candy out onto a cutting board and start slicing. It will stick, but you can easily scoop up the pieces with an offset spatula. – Wrap them in waxed paper and hand them out to all your friends! There are two types of cooks. First there are those that burn through recipes and techniques, dipping their toes in many different things and gaining all different kinds of loose intuitive knowledge. Then there are those who master the art of perfecting whatever they are into at the moment. They tinker and tinker with the same dish until they have it down to a science. I am very much not the second type. I’ll just go right ahead and say it: I have a short attention span. It’s rare that I’ll do anything twice, no matter how much I like it. Vacations, restaurants, recipes: I’m always curious about whether there’s something more fun, so repeats don’t happen often. It’s weird, if you ask me to list the best restaurant meals of my life, I’ve probably never been to any those places twice. I can’t help it! But. Every now and then, I get presented with an opportunity to get completely OBSESSED with one thing. It usually means I have no choice, or I’m fighting a string of particularly bad luck with a dish. 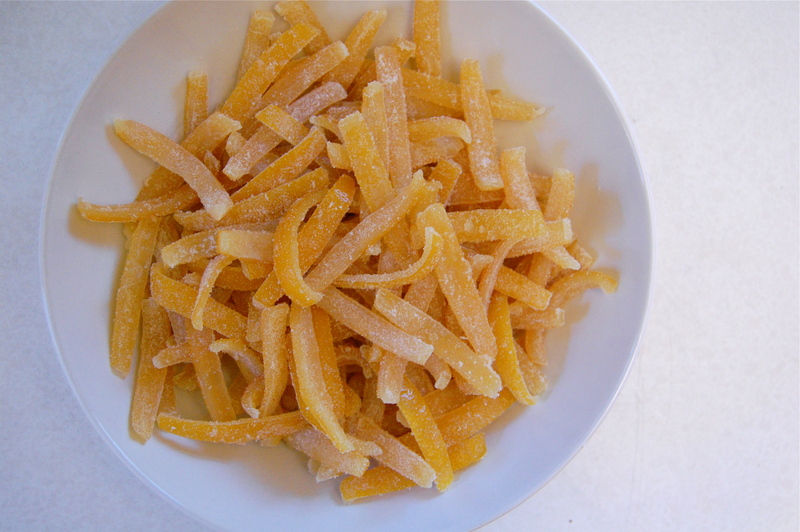 Right now, the stars have aligned and it’s all candied citrus peels. We have this dessert on the menu at Delancey, a meyer lemon budino. A yummy rich lemon cream that is (thankfully) being well received. 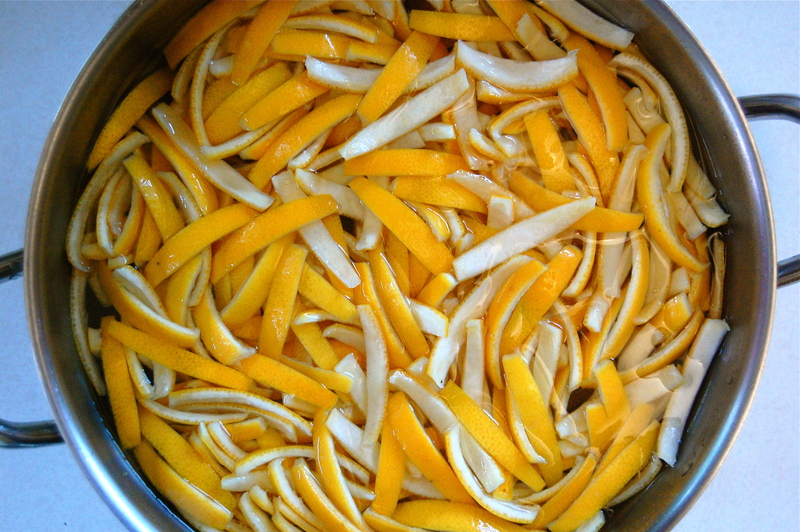 The cream uses a ton of meyer lemons, but mostly just the juice. After seeing piles and piles of lemon rinds being tossed, I started hoarding them. If there was ever a time to candy citrus, then THIS was it. You see, tucked away in my brain’s recesses was a desire to perfect the technique of candying citrus. I know it’s not exactly hard, but I seem to have a very high standard. I dream of these perfect little gummy peels, flexible and soft, evenly coated with sugar, chewy when you bite into them, and not a trace of bitterness. For something that only has 3 ingredients, I had a hard time finding a way to consistently get perfect candy. But after about 5 rounds with the peels (that would be 5 weeks worth of budino scraps), I am proud to report that I’ve finally got it. What I think is the perfect technique for candied citrus. 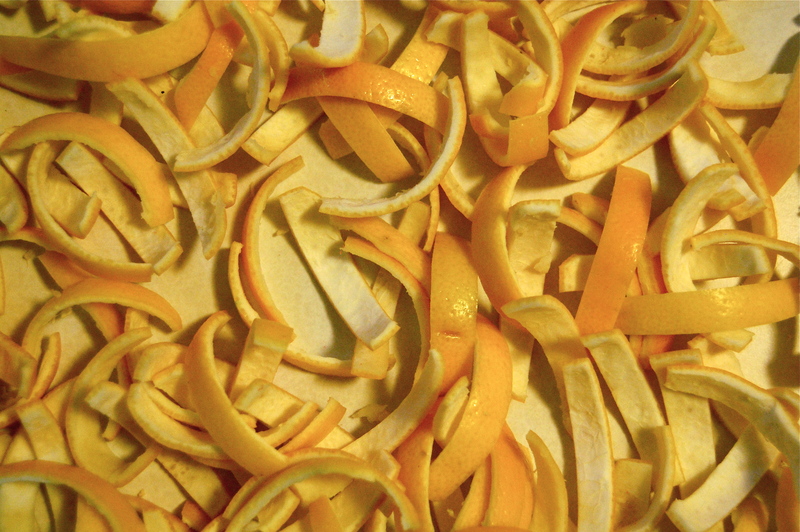 First I sliced up my peels to the ideal size. Then I placed them in cold water and brought that to a boil. As soon as the water boiled, I drained them out. I did this 3 times, rinsing the heat out of the peels between each blanch so that they always started in cold water (without rinsing they will warm the water up immediately). This step helps remove the bitterness from the remaining pith. Then I made a simple syrup of equal parts (in volume) of water and granulated sugar. I made just enough to cover the peels by 1/4″ or so in the pot. I brought them to a bare simmer (not a full boil) and let them poach for 4 hours. I checked them for doneness by pulling out a peel and holding it up the window. I want to be able to see through it. Then, I take the peels off of the heat and place the whole pot in the fridge. I leave them there, covered, for 2 days. It may seem excessive, but I’m convinced that this part gives the peels the delicious gooey soft texture I like. Obviously they can be stored in their liquid (refrigerated) as long as you like, think of 2 days as a minimum soaking time. 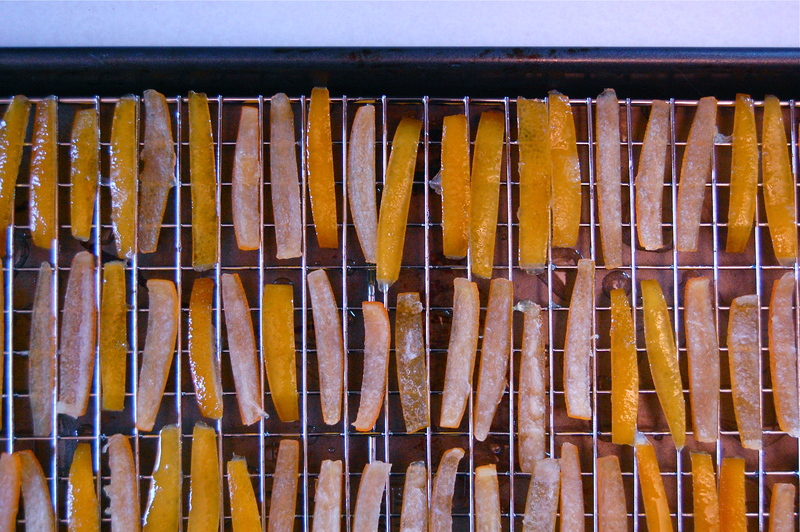 Once they’ve soaked, I laid them out on a drying rack over a sheet pan. This is the part where I had my epiphany. Previously, I had simply left the pans out for a couple of days to dry out. After several batches of not guessing the right time (not long enough and the sugar they get tossed in will clump up and become hard and crusty; too long and they get hard and lose their gummy bear texture) and getting extremely frustrated with the humidity in Seattle, it finally hit me: put them in the oven. Duh. So I did just that. And after about 2 hours at 180 degrees, they came out perfect for tossing. I started by toasting the pecans for a few minutes, to perk them up. Then I mixed the sugar, cream, butter, salt, molasses and bourbon in a largish pot. I let that boil, stirring occasionally, until it reached 240 degrees. I let it sit in the pot cooling, still stirring occasionally, until it reached 210 degrees. I stirred in the toasted nuts, making sure to get them well coated. Then I poured the mixture out on a sheet pan. I let it cool for 1 minute to start setting up, then sprinkled sea salt on top. Because I like my candy salty. You can omit that step if you prefer unadulterated sweetness. After it cooled completely I broke the praline into chunks. And then started passing it out to anyone who walked by. Because this stuff is like crack. Pure candy crack. Definitely dangerous, definitely best to share it before I scarf it all down myself! And did I mention that it took like 20 minutes? So really, there are no excuses. – Spread pecans on baking sheet and toast for 4 minutes. Let cool completely. – Line another baking sheet with parchment. Set aside. 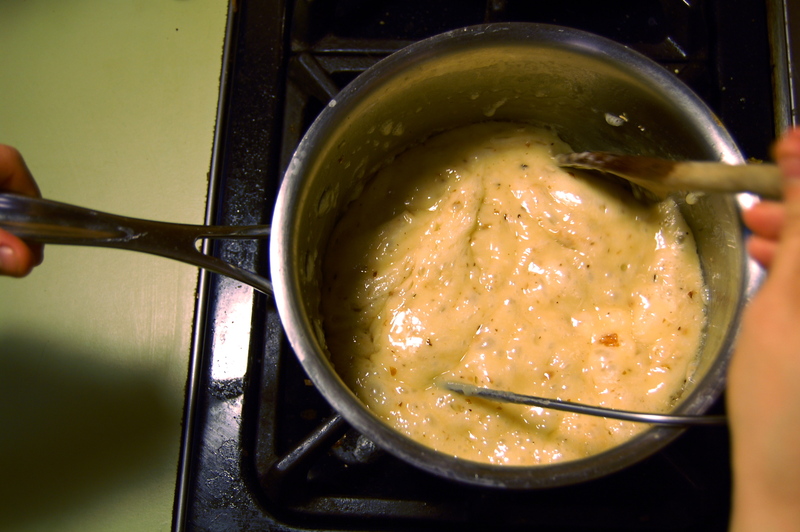 – Cook over medium high heat, stirring to break up lumps. – Bring to boil and cook, stirring occasionally, until it registers 240 on thermometer. – Remove from heat and let cool until it reaches 210. 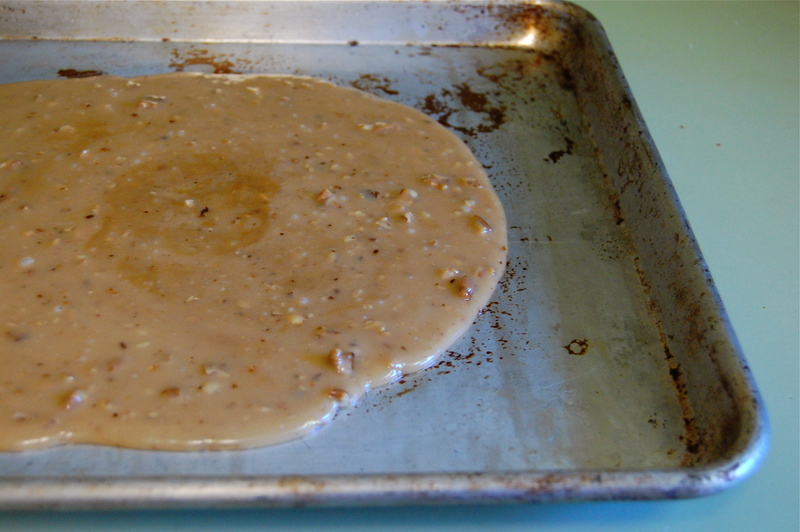 – Add the pecans and stir vigorously (you have to work fast because it will start to thicken). 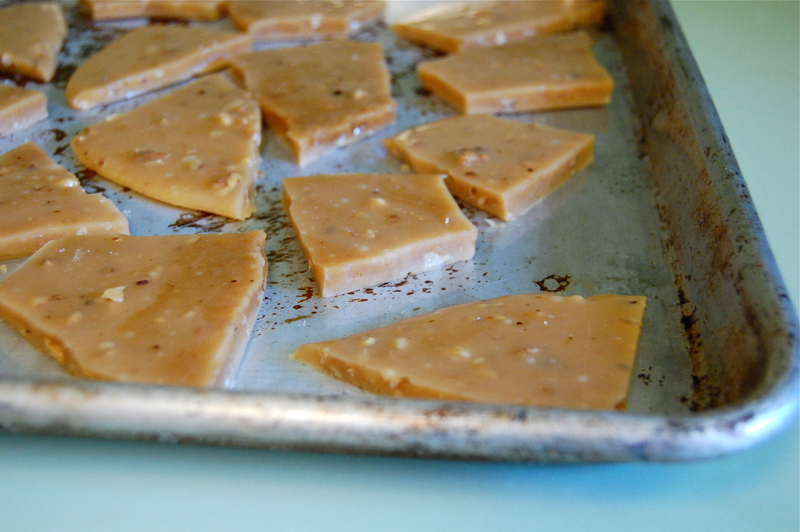 – Pour mixture onto the sheet pan and let it cool for 1 minute. – Sprinkle on sea salt. – Let cool for an hour and then break into chunks. Today was fun. While lazing about the house with a sad tummy, I was thinking of marshmallows. Not eating them, just making them. After a botched attempt last year I was feeling the need to redeem myself. Several hours later I became a believer that EVERYONE should make homemade marshmallows. Just once. It is total kitchen magic. I had the itch (and some extra egg whites) and decided to make a batch of raspberry flavored mallows. I started by oiling and then dusting a pan with powdered sugar and cornstarch. Since it takes a while to get up to temp, I started boiling my sugar syrup. Then I rubbed some vanilla bean seeds with a bit of sugar. I tossed that in with some raspberry puree (still had some of the freezer from this day). Then I sprinkled on some gelatin, stirring to keep it from clumping. Since it immediately becomes stiff, I placed it over a pot of simmering water to melt the gelatin down. This part is a bit tricky: You want the gelatin warm to loosen it up, but if it gets too warm it smells just awful. So have your nose be your guide. If you can smell it, remove it from the heat and stir using the residual heat. If your house suddenly smells like livestock, you have gone too far. I did that once and couldn’t eat a marshmallow for a year. Seriously, gelatin is creepy. In a fabulous sort of way. I started whipping some egg whites into a stiff meringue. And then slowly poured in my syrup. I let that whip for a few seconds, and poured in the raspberry mixture. I continued whipping, until the marshmallow had cooled and tripled in volume. I poured the marshmallow onto the prepared pan. And attempted to flatten it out. I let it sit for 3 hours and then turned it onto a powdered sugar coated board. I sprinkled on a thick layer of more powdered sugar and let it sit for another hour. I rolled the little squares in more powdered sugar and played with them for a while. And what do we do with fresh yummy squishy marshmallows? We dip them in Chocolate! – Mix the cornstarch and powdered sugar together. Prepare a 9″x13″ pan by greasing it lightly with vegetable oil. Dust it with half of the powdered sugar mixture. – Combine granulated sugar, corn syrup and 3/4 cup water in a pot over low heat. Stir until the sugar is dissolved. Stop stirring, bring to a boil. Place a thermometer inside. You want the syrup to eventually reach 260. – While syrup is boiling, mix together vanilla bean seeds and 1 TBSP sugar. Rub with fingers until seeds are incorporated into sugar. Mix raspberry puree, water and vanilla sugar in a bowl. Sprinkle gelatin on top, stirring it in to keep it from clumping. Place this over a pot of simmering water to melt the gelatin. – Begin beating the egg whites until stiff. Once they are stiff and syrup is at 260, begin slowly pouring in syrup while continuing to beat the whites. Beat for 30 seconds to incorporate. – Beat in raspberry puree mixture. Continue beating until marshmallow mixture is cooled and tripled in volume. – Immediately pour into the prepared pan and quickly smooth the top flat. Let the marshmallow sit, uncovered, for at least 3 hours at room temperature. – Dust a work surface with the rest of the sugar cornstarch mixture. Run a knife along the edges to loosen the marshmallow and turn out onto the surface. Cover with a layer of powdered sugar and let sit for 1 hour to develop a sugar crust. – Cut the marshmallow into squares and toss the squares in powdered sugar. Store in an airtight container for up to a week. I’m not saying it wasn’t fun, I’m just saying if you ever hear me talk about making 400 reinvented classic candy bars I want you to hit me. Today I post the last and most certainly not least in my candy bar collection – The S’mores bar. I know technically it’s not a candy bar, but well, who cares? It is now! First I made a graham cracker crust. Then I whipped egg yolks and powdered sugar until fluffy. Then I melted butter and mixed in cocoa powder and chocolate. I whisked in the egg mixture and then folded in some whipped cream. I spread the mousse onto my crust and popped the tray into the freezer to firm up. I sliced them into bite-sized squares and put them back in the fridge. While they were chilling I made a meringue and piped it on top. I used a torch to burn the meringue. So cute! – To make the crust: Combine the graham cracker crumbs with the melted butter and granulated sugar until well combined. Press into the bottom of a 9×13-inch metal baking pan. Bake the crust until it starts to brown and become crisp, about 10 minutes. Transfer to a wire rack and let cool completely. – To make the filling: Using an electric mixer, beat the egg yolks and confectioners’ sugar together in a large bowl until they are thick and the color of butter. Beat in the vanilla and salt. – Melt the butter in a medium saucepan over low heat and whisk in cocoa powder until smooth. Remove the pan from the heat, add the chocolate, and stir until the chocolate is melted and the mixture is smooth. Let cool slightly, then gradually beat into the egg mixture. – Fold the softly beaten heavy cream into the chocolate mixture just until combined. Spoon the chocolate cream over the graham cracker crust, smoothing it evenly with a spatula. Cover the pan with plastic wrap and freeze for 3 hours. – When ready to serve, make the meringue: Combine whites and sugar in a KitchenAid bowl. Place over a pan of simmering water and whisk continuously, until the whites register 155 on a thermometer. Transfer to mixer and beat until cooled. It should be thick and shiny. Beat in the vanilla. – Carefully slice the s’mores into squares using a hot knife. Top each with the meringue in a large dollop. Use a torch to carefully burnish the meringue until topped with golden brown. Serve immediately. Today I tackle the Twix candy bar, another personal favorite! I got started by cooking the dulce de leche. This was a time-consuming task involving about 3 hours of cooking over a pot of simmering water to evaporate the water without scorching the milk. Then I made a shortbread dough and pressed it into a buttered pan. I pricked holes in the dough and baked it until it was nice and browned. I spread on top my dulce de leche and popped it in the freezer to really firm up. And then I spread on some chocolate. And then disaster struck. Big time. 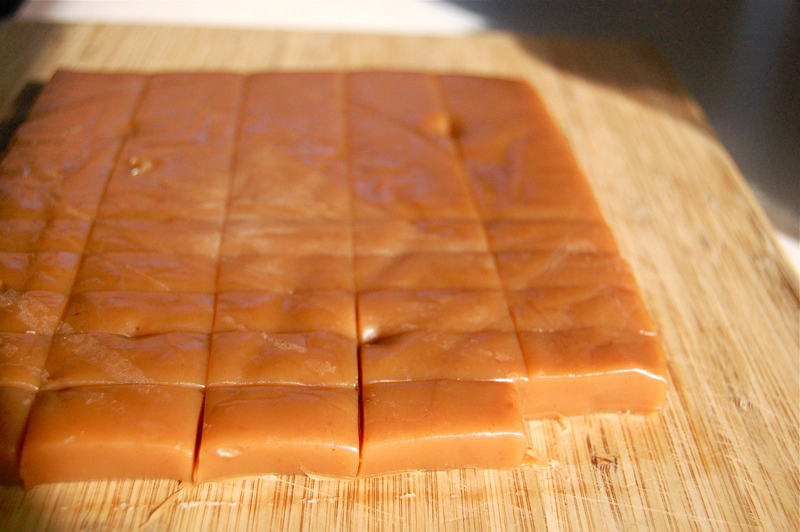 When I cut my little bars, all of the dulce de leche oozed out the sides. Totally not cute at all. By this time it was midnight, I had worked a full shift at the restaurant and was NOT in the mood for failure. But these little punks didn’t care. They failed anyways. So I broke up with them, kicked them out of the candy bar club and officially disinvited them from the party. 1. Preheat the oven to 350°F. butter the bottom and sides of a 9-by-13-inch baking pan. 2. In the bowl of an electric mixer fitted with the paddle attachment, beat the sugar and butter together until blended. 3. Add 2 cups of the flour and beat until well combined. Add the egg yolk and beat for a few seconds, or until just combined. 4. Turn the dough out onto a lightly floured work surface. Dust the top of the dough and your hands with a little flour. Use your hands to gently work the dough into a 6-by-6-inch square. You will have to turn the dough and sprinkle the top with flour as you go. Sprinkle the remaining 1/2 cup flour on the surface of the dough. Fold the dough over and knead until incorporated, then flatten the dough into a rectangle. Transfer the rectangle to the prepared pan and press it into the pan. 5. Prick the dough all over with a fork and bake in the center of the oven for 23 to 26 minutes, until golden brown. Transfer to a wire rack and let cool completely. 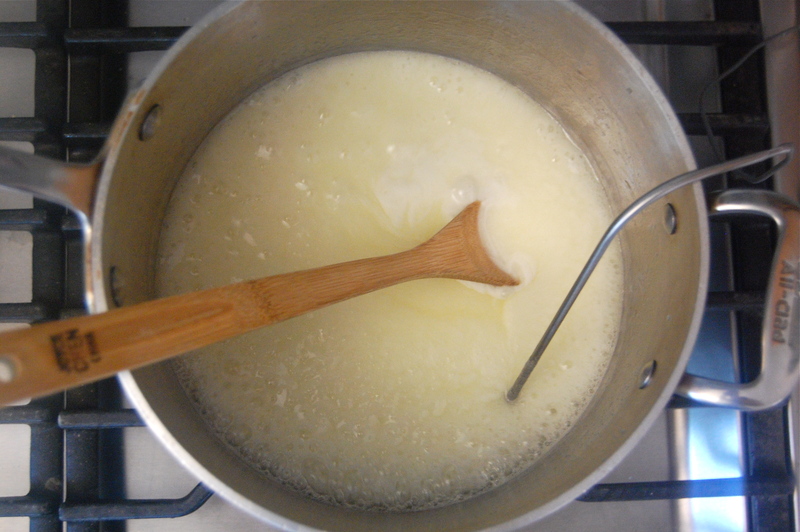 Put the sweetened condensed milk in a medium heat-proof bowl and set it over a saucepan of boiling water over low heat with the seeds from 1/2 a vanilla bean. Cook for 1 1/2 hours, until thick and caramel colored. Remove the bowl from the pan and beat until smooth. 3. 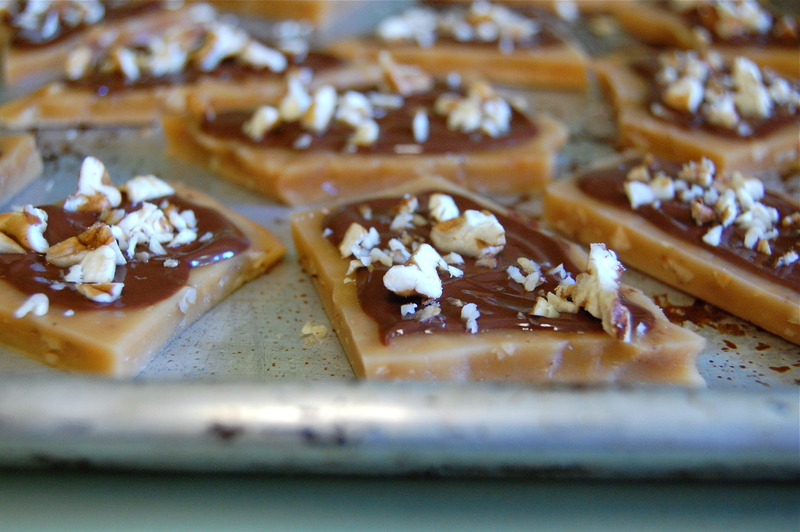 Pour the caramel filling over the cooled shortbread and place the pan in the refrigerator until cool, about two hours. 1. In a large nonreactive metal bowl, combine the chocolate, corn syrup, and butter. Set the bowl over a saucepan of simmering water and cook, stirring with a rubber spatula, until the mixture is completely smooth. Remove the bowl from the pan and stir for 30 seconds to cool slightly. 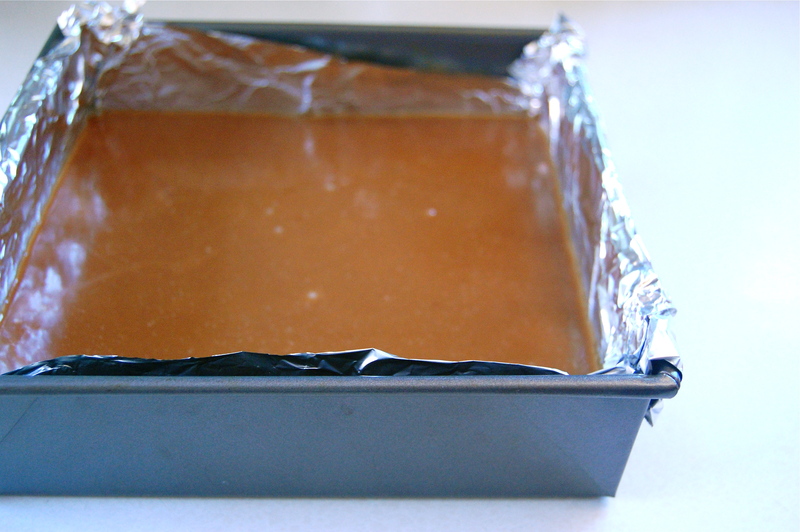 Pour the mixture over the chilled caramel layer and use an offset spatula to spread it into an even layer. 2. Put in the refrigerator for 1 hour, or until the glaze hardens. 3. Remove the pan from the refrigerator 30 minutes before serving so as not to crack the chocolate glaze. Cut into squares and serve.